Fruit cake gets a bad rap. You say ‘fruit cake to someone’ and they usually turn up their nose. I mean, I understand. When you think of fruit, you don’t usually tend to think of cake or vice versa. However, it’s so popular this time of year, especially here in Newfoundland. 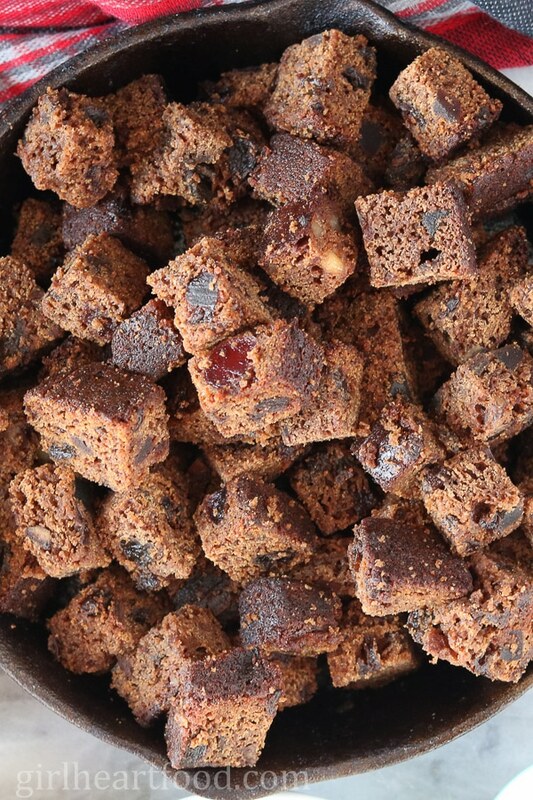 If you don’t enjoy fruit cake in it’s natural form, then this fruit cake bread pudding will surely turn your crank. Every year my mother in law gives us a lovely dark fruit cake. For those who are unfamiliar with this version of fruit cake, it has molasses and lots of clove. It’s warming and delicious with ice-cream. However, the gifted cake is huge and it’s a lot for hubby and I. This fruit cake bread pudding is an easy, and delicious, way to use up some of that cake and enjoy it in a new and exciting form. The preparation of this couldn’t be easier (but you knew I was going to say that, didn’t ya?) Nobody has time for fussy recipes during the busy holiday season so this one is perfect. Sprinkle with chocolate chunks and bake. 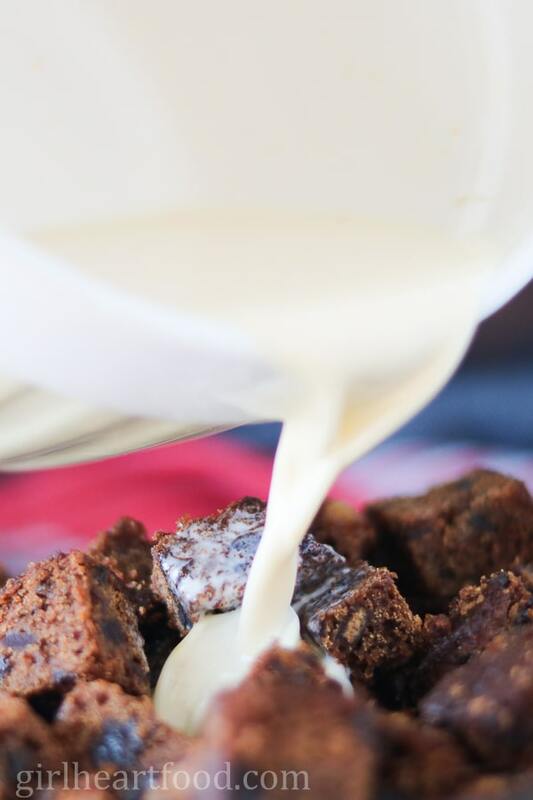 This fruit cake bread pudding would be one delicious way to start Christmas morning. While it’s in the oven, sit back and sip on that first coffee (always the best one, may I add). Finish with a sprinkling of walnuts and pomegranate for freshness and pop and you’ve got yourself with yummy treat! Thank you all SO MUCH for your support of me and my little food blog. It means the world to me to be able to chit chat with you, sharing recipes and stories from my every day life. Merry Christmas, Happy Holidays. All the best to you and yours! P.P.S. If you missed my last recipe, you can check it out here. Preheat oven to 350F. Spray skillet (I used an 8 inch skillet) with Pam. To skillet, add fruit cake. Note: If you don't have a small skillet, use a small casserole dish. In a bowl, add milk, cream, eggs, vanilla extract, and orange zest and whisk to combine. Pour over fruit cake and press fruit cake down to soak up some of the milk mixture. Sprinkle chocolate chunks over mixture. Bake for 30 minutes. 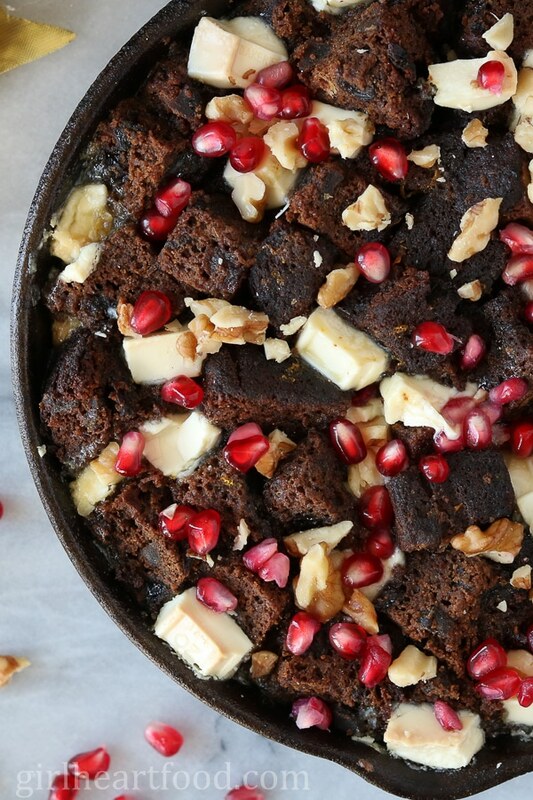 Carefully remove from oven and garnish with walnuts and pomegranate arils. Enjoy as it or with ice-cream or whipped cream! I used dark fruit cake in this recipe. It has flavours of molasses and clove. If you can certainly use regular light fruit cake here. If you do, I suggest adding a pinch of clove in your milk/cream/egg mixture. this is such a great idea. easy to put together and delicious. will be great for sudden guest.